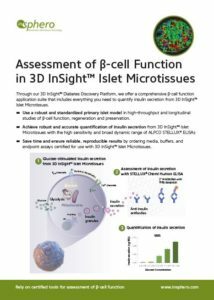 Through our 3D InSight™ Diabetes Discovery Platform, we offer a comprehensive β-cell function application suite that includes everything you need to quantify insulin secretion from 3D InSight™ Islet Microtissues. InSight™ Islet Microtissues are uniform, functionally robust and long-lived primary islets delivered in an assay-ready, automation-compatible format. 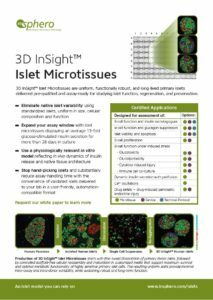 3D InSight™ Human Islet Maintenance Medium is optimized for pancreatic islet microtissue culture to support healthy endocrine activity and viability of islet cells in long-term culture. 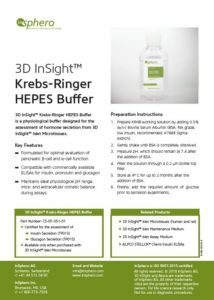 3D InSight™ Krebs-Ringer HEPES Buffer is a physiological solution designed for the assessment of hormone secretion from 3D InSight™ Islet Microtissues. 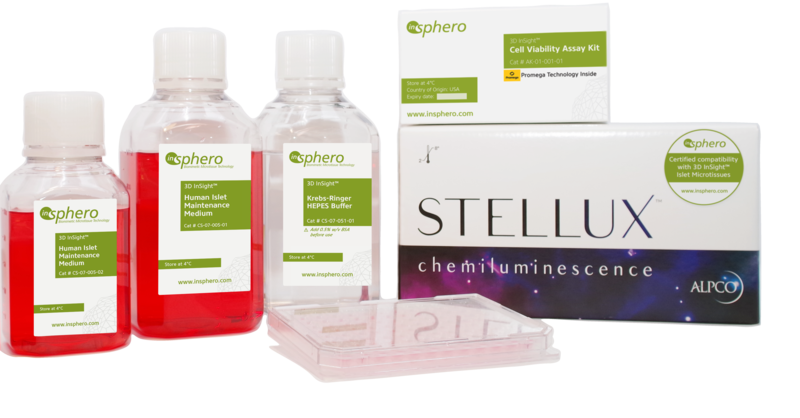 3D InSight™ Cell Viability Assay Kit provides a rapid, homogeneous method for determining microtissue viability based on quantitation of ATP content, an indicator of metabolically active cells. 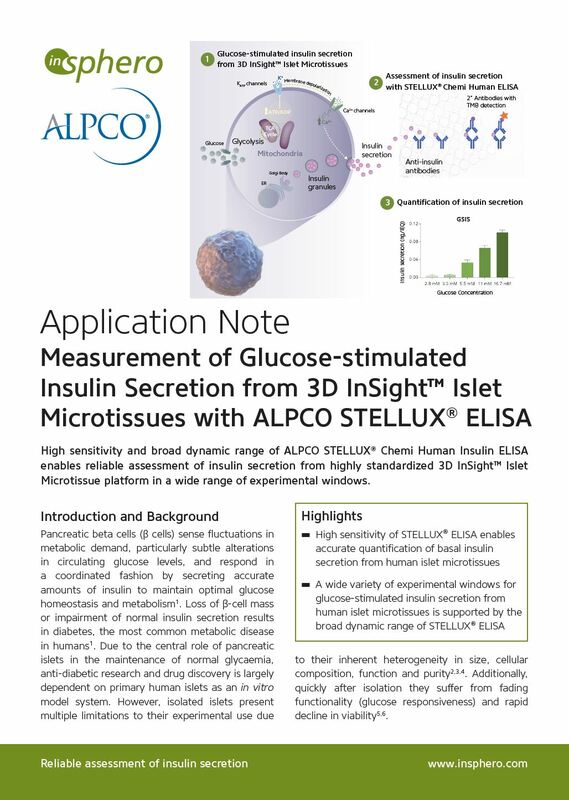 ALPCO STELLUX® Chemi Human Insulin ELISA is a highly sensitive enzyme-linked immunosorbent assay (ELISA) with a broad dynamic range ideal for quantifying insulin secretion from 3D InSight™ Islet Microtissues. Read our application note on assessment of β-cell function in 3D InSight™ Islet Microtissues using the ALPCO STELLUX® Chemi Human Insulin ELISA and learn how you can apply this application suite to take full advantage of two best-in-class systems. 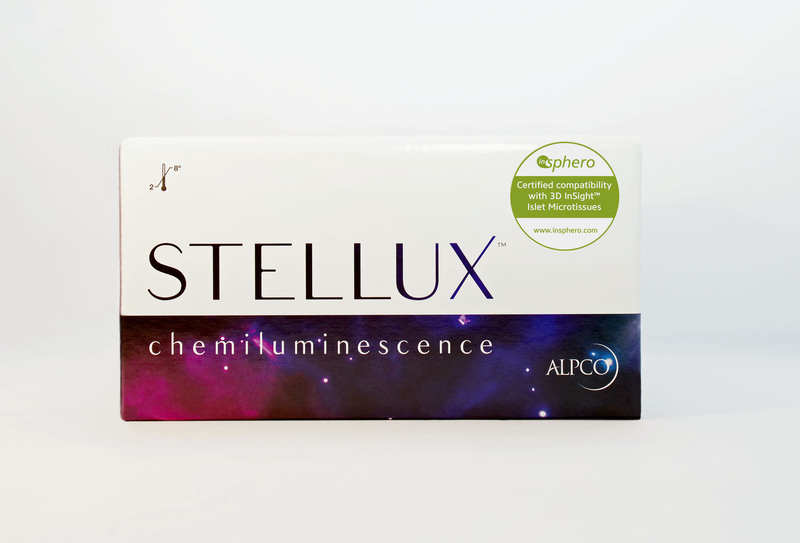 The STELLUX® Chemi Human Insulin ELISA measures the concentration of insulin protein products and offers superior performance compared to other similar kits in the market. The assay utilizes a dual-monoclonal antibody sandwich format, tri-level control set, and 96-well microplate comprising removable strips. The assay can measure up to 37 samples in duplicate and can be used in a variety of sample types. Significantly reduces sample preparation time by eliminating dilution steps and the guesswork involved in determining dilution factors, saving time and money. No guessing, no diluting, no repeating. Superior assay sensitivity compared to current competitive products on the market. LOD: <2.0 pg/mL, with a lower limit of quantification of 20 pg/mL. The assay works with human serum, heparin plasma and tissue culture supernatants. TLot validation includes functional sensitivity, inter- and intra-assay precision, accuracy, LLOQ , and ULOQ. Our Islet platform development team rigorously tested various commercially available insulin ELISAs on the market and ALPCO’s STELLUX® ELISA technology either met or exceeded all our criteria for certification.